A “phase converter” converts single phase power into 3 phase power. A converter is used where 3 phase power is not available or is too expensive. There is several types of phase converters on the market today. NAPCco offers several types and styles phase converters for every application, equipment and machine that requires 3 phase power. 6 Months to pay on $99+. Click here for details. Call us and we will size your converter with a guarantee it’s correct for you application. Pro-Line Rotary Phase Converters are a general purpose work horse used to converter one phase power into 3 phase. The Pro-Line uses a motor-generator and power factor correction capacitors to provide utility grade 3 phase power. The pro-line is an economical solution for all types of loads – motors, resistive, inductive and CNC. Smart-Boost™ Digital Rotary Phase Converters are the perfect product for those hard starting / high inertia motor loads. 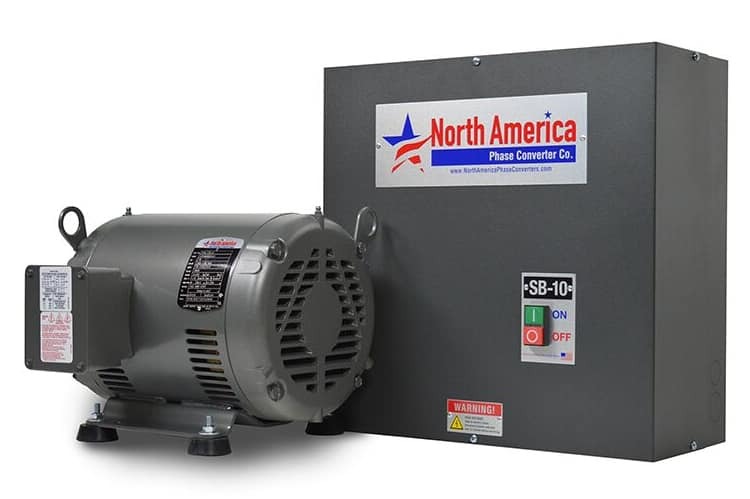 The Smart-Boost™ is ideal for pumps, blowers, fans and compressors. The Smart-Boost™ units uses a motor-generator and a solid state electronic controller to convert single to three phase. Smart-Phase™ is a digital rotary phase converters that are best suited for voltage sensitive machines and/or multiple loads running simultaneously. It has the newest advancement in phase converters technology with 9 stage automatic voltage regulation (AVR). Solid state switches are used to regulate the voltage and provide balanced voltage helping your equipment to run as efficient as possible. Ideal for CNC machines, motors controlled by a VFD or equipment loaded with electronics. A static phase converter is used to generate 3 phase power during the starting of a motor. A static phase converter consists of one or more start capacitors and a start relay. The start capacitors produce electricity across the third winding of a motor during start up, once the motor is up to speed these capacitors are disconnected from the motor winding. The motor load is now running on just the two single phase lines of power (in essence, the motor is single phasing). Rotary Phase Converter Control Panels are half of a rotary phase converter. This is for the customer that has his/her own 3 phase motor to use as an idler motor. The rotary phase control panel includes a motor starter, power factor correction capacitors and input and output terminal block connections. No two application are the same. That is why NAPCco offers several accessories to customize your installation to fit your needs. Accessories include upgraded enclosures, mounting feet, capacitors, timers, wired and wireless switches, mounting plates, power time delay kits and auto controls.